This malware used a Christmas-themed exploit document to deliver its payload, BKDR_GAMFRIC.A. The backdoor (MagicFire) is rarely seen in the wild possibly because its only use in targeted attacks. 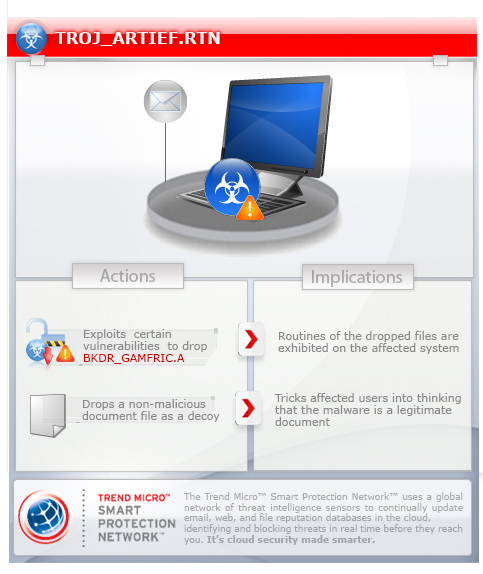 Scan your computer with your Trend Micro product to delete files detected as TROJ_ARTIEF.RTN. If the detected files have already been cleaned, deleted, or quarantined by your Trend Micro product, no further step is required. You may opt to simply delete the quarantined files. Please check this Knowledge Base page for more information.